MRI is the imaging modality of choice for imaging the spine in a child with a neurological deficit. The multiplanar capability of MRI allows the visualization of the spine in 3 planes, and the contrast resolution allows excellent conspicuity of the intraspinal contents, vertebral bodies, and discs and paraspinal soft tissues. This is illustrated in the following example of a 10-year-old child who presented with a mass in the posterior triangle of the neck. Coronal T1-weighted MRI of a schwannoma at C1/C2. The dumbbell morphology is well demonstrated in the coronal plane. There is extradural compression of the upper cervical spinal cord. Routine study includes T1- and T2-weighted images: Conventional MRI of the spine includes sagittal T1- and T2-weighted images and axial T1- and T2-weighted images through any abnormality. Scan entire spine when dysraphism is present: For imaging of congenital anomalies, e.g., spinal dysraphism, spaced axial T1-weighted images are acquired along the length of the spine to ensure detailed visualization of the cord and filum terminale. Sagittal image thickness should be reduced to 3 mm to allow for the small size of the pediatric spine (6). 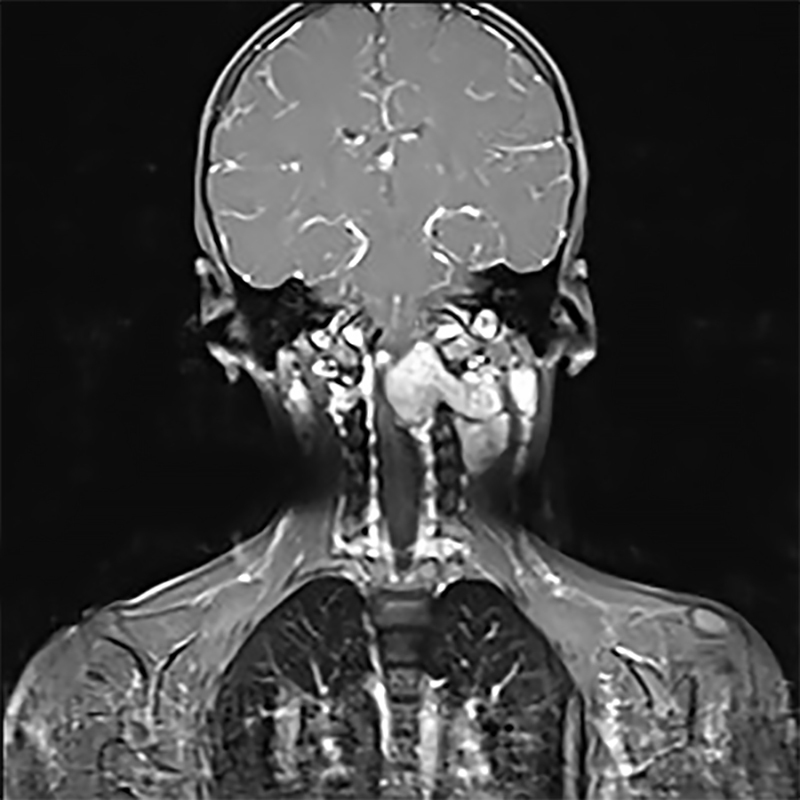 Fat-saturated MRI for trauma: The addition of fat-saturated T1- and T2-weighted (or STIR images) in the sagittal and axial planes is helpful in trauma cases, as these imaging techniques are very sensitive to bone marrow edema and ligamentous injury. 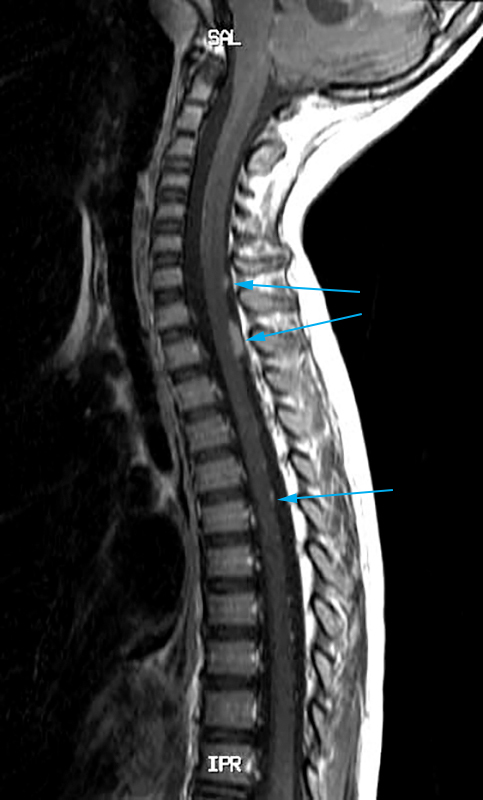 Sagittal STIR image following spinal trauma: Signal change due to bone marrow edema is seen at multiples levels in the lower cervical and upper thoracic vertebrae. Evidence of wedge compression fractures, particularly at C7 and T4. Include brain images if infection is suspected: Imaging of the brain in children with spine disease or trauma may aid the diagnostic process. Involvement of the brain and spine would guide the radiologist towards the diagnosis of acute disseminated encephalomyelitis or infection. 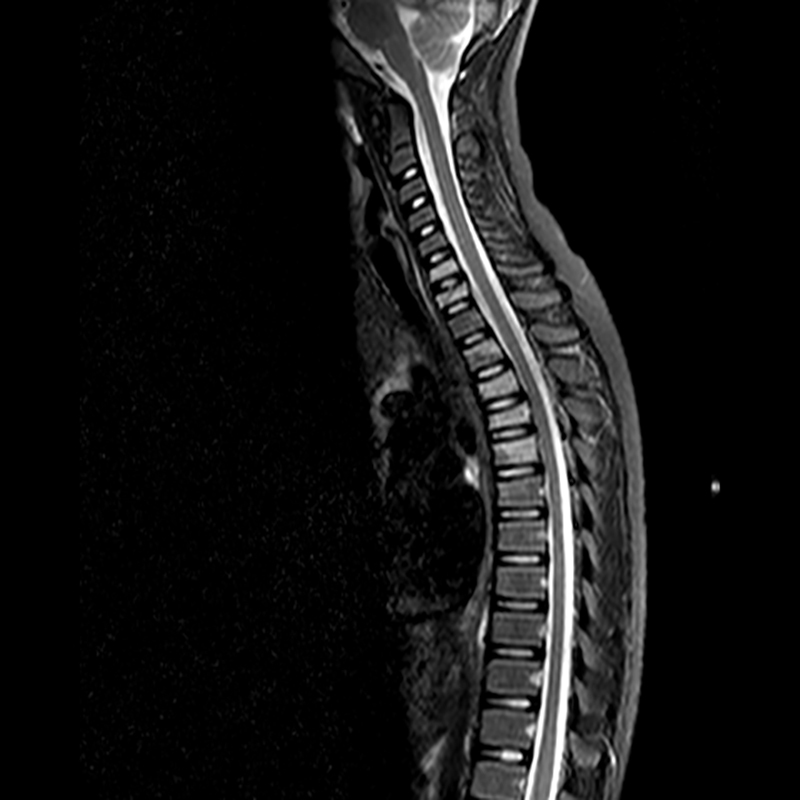 T2-weighted sagittal MRI of post-infectious demyelination: This image shows extensive but patchy signal change and swelling of the cord to the level of the conus in a 6-year-old child presenting with paraparesis and urinary retention for 1 week. 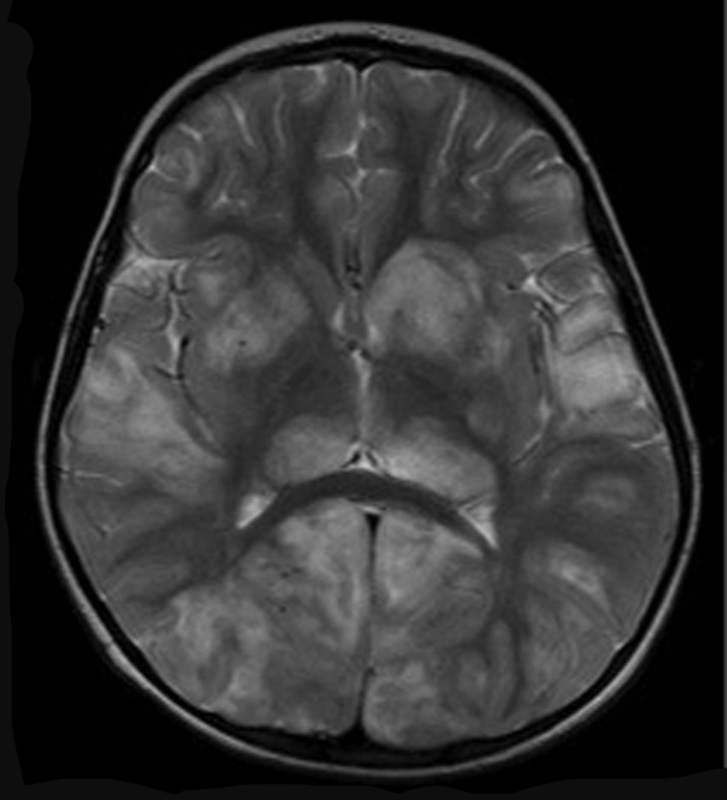 T2-weighted axial MRI of brain in child with post-infectious demyelination: This image shows multiple white and grey matter lesions throughout the brain confirming the clinical suspicion of an inflammatory post-infectious demyelinating disease. Leptomeningeal involvement by tumor: Disseminated tumors also involve the leptomeninges of the brain and spine (figure below). MRI usually requires sedation or general anesthetic in the young child. Sagittal T1-weighted gadolinium-enhanced MRI: Shown is a child with a medulloblastoma and leptomeningeal spread of the tumor to the subarachnoid space of the spine (enhancing deposits on dorsal surface of spinal cord –blue arrows).